Valworx 563206E electric actuated 3-way T-port stainless steel ball valve is used to control the flow of water, air, oil, and other media compatible with the materials of construction. 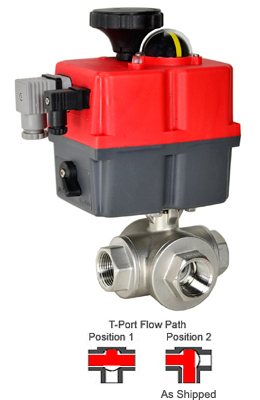 These FULL PORT valves are typically used as a diverter valve. Actuator uses power-to-open (position 2) and power-to-close (position 1), stays in last known position with loss of power. On receipt of a continuous voltage signal, the motor runs and via a self-locking gear drive rotates the ball one quarter turn. The motor is automatically stopped by internal cams striking limit switches. On receipt of a reversing continuous signal, the motor turns in the opposite direction reversing the valve position.